I'm glad to say that I really enjoyed myself at the Alternative and Burlesque fair in Manchester. Definetely attending the next one in May and if you are in the NorthWest, hoping to see you there. I love all of these long flapper style necklaces (and I already have some styles on my website) but I wanted to create a style that was slightly simpler and therefore more wearable for everyday. 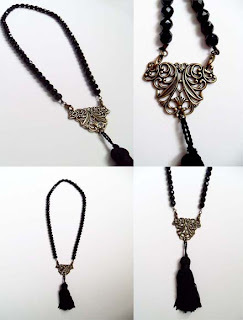 I can see this necklace worn over a romantic black maxi dress or even a plain pencil dress at work. What do you think? Do you wear big bold black jewellery during the day or leave it for when it's dark? Since Christmas I have been incredibly busy with a quite packed schedule. I am planning a photoshoot for my summer items and also organizing myself and making sure I have enough stock for this year's trading events. The most immediate one is the Manchester Burlesque and Alternative fair, which I haven't done before but I am really looking forward to. Offering up to 50 STALLS, THREE THEMED SHOPPING FLOORS, 2 PERFORMANCE STAGES, a full programme of entertainment & installations + a lounge bar chill-out area and private outdoor terrace. If you are in North or North-west England, don't hesitate in coming to have a look. These sort of events are usually rare up north with the exclusion of the Whitby Gothic Weekend. I;ll be showcasing both my clothing and jewellery! I received a comment recently from Amanda (the author of a very good makeup tutorial credited on my previous smokey eyes post) to update the link. However, I had a look at it and it actually adds more to the previous post so I am not going to change it but show you the updated link she's sent me. It is a completely new post with a new video. You decide which tutorial you prefer to follow. I find both of them very helpful.